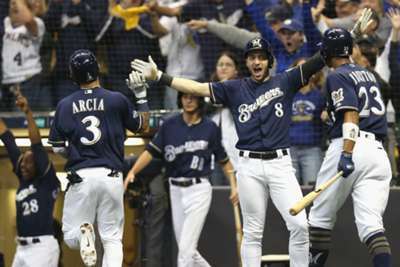 The Milwaukee Brewers are one win away from the MLB National League Championship Series after blanking the Colorado Rockies 4-0. Milwaukee shut out Colorado in game two to take a 2-0 lead in their NL Division Series on Friday. The Brewers and Rockies were locked in a 1-0 battle until the eighth inning, when Mike Moustakas plated a big run with an RBI single and Erik Kratz plated two with a Texas Leaguer, which made the score 4-0 and insurmountable for Colorado. Someone who understands these two teams, that is who. However, look to the Rockies and you will see why it is not. Colorado are a much better pitching team this year than in past seasons with a starting rotation that has high ground-ball pitchers and a bullpen with serious power arms. While Milwaukee do not have that rotation which puts fear in the hearts of opponents, they do have a seriously good, high-strikeout bullpen and a better rotation than some might think. It is not as stark as some would like to make it, but the first two games of this series have been played in Milwaukee so the run scoring might not be quite as high as when the series heads to Coors Field on Sunday. Chacin: MLB's best free agent starting pitcher signing? That title will go to Miles Mikolas of the St Louis Cardinals, who was dominant in his first year back in the United States. However, Jhoulys Chacin has a legitimate argument to be the second best after going 15-8 with a 3.50 ERA in 35 starts and 192.6 innings pitched in the regular season. He also has had the best postseason of any free agent starting pitcher as he tossed five shutout innings on Friday and (while this was not the postseason, but it contributed to it) he also tossed 5.6 innings of one-run ball in the playoff for the Central Division and helped the Brewers win said division for the first time since 2011. No, we are not saying anyone are better than the Los Angeles Dodgers, but what we are asking is, could this year's Brewers bullpen be better than the Dodgers of last season? It is hard not to see comparisons between the two teams from this year to last year, and it is easy to see how Milwaukee could employ their bullpen similarly to how the Dodgers did last season on the way to the World Series as Los Angeles never let a single pitcher get past the seventh inning and only allowed two to get into the sixth.